SCAR debuted to a packed house at the Las Vegas Convention Center during the 2015 SEMA show. Spectre Performance driver, Greg Thurmond, owner/builder of GTS Customs Corvette Specialists in Southern California, has been building custom Corvettes, similar to SCAR, for close to thirty years. 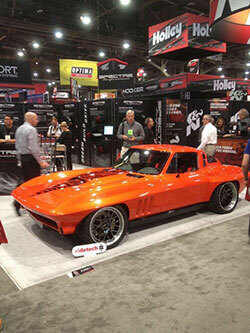 You may recognize him and his 1965 Candy Tangerine Corvette that debuted in 2015 at the Spectre Performance booth at SEMA. He is one of the nation’s premier corvette builders and quite the corvette enthusiast. Thurmond’s passion for cars came early on, telling us that, “I’ve been a Corvette enthusiast as long as I can remember”. 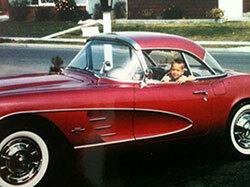 Greg was just three when his dad brought home his first Corvette. Greg’s dad worked as an engineer for Lockheed after serving in the Army. He married his high school sweetheart, began a family, and moved to the suburbs in Southern California and started living the American Dream. For them, that dream included motorcycles, Corvettes and drag boats. Being raised in Southern California, Greg had a chance to enjoy the great outdoors. Whether it was water skiing, riding bikes or motorcycles, he and his friends spent their days exploring all that California had to offer. Evenings and weekends would find him helping his dad in the garage with their L88 big block, flat bottom drag boat, or tuning up his dirt bike for a weekend at the desert or the track. Where Thurmond’s passion for cool cars all began. The driveway of his family home in Southern California. By high school Greg was working at his parents’ upholstery shop where he had developed his skills as a master trimmer and upholsterer. He worked on boats seats, tonneau covers, car interiors, you name it, he upholstered it. He developed skills in body and paint as well. In fact, one of his first paint jobs, at age 15, happened to be his father’s 1963 convertible Corvette that went on to win numerous shows and awards. Following in his father’s footsteps, Greg worked on his own cars, dirt bikes, and ATV’s, doing whatever he could to make them better, make them faster. He learned at an early age that going faster was fun. He was a natural on a dirt bike and that led him to racing. He garnered the attention of sponsors and magazine editors when competing in Mickey Thompson Stadium races at Pomona Fairgrounds, Ascot Raceway, Indian Dunes, Saddleback, Carlsbad, and Corona. From 1981 - 1987 his dirt career included multiple championships in CRC and AME. With over 50 career wins, he was sought out to test ride for several magazine publications such as 3 and 4 Wheel Action, Dirt Wheels, and Dirt Bike. He test rode for Honda, Suzuki, Kawasaki (dirt and water) and Polaris. 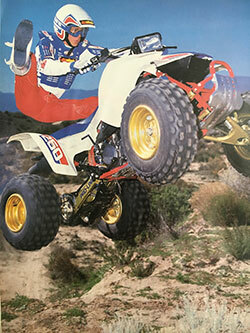 In fact, he was even part of Polaris Factory Team for the Baja 1000 in 1986. Fast forward a couple of decades and we see Greg back out on the track doing what he loves. But this time he has combined his love of cars, specifically Corvettes, with his passion for racing. He started auto crossing in 2012. His chassis builder, Paul Newman of Newman Car Creations, encouraged him to bring his 1964 Corvette out to El Toro for an event called Run to the Coast. With family in tow, he spent a sunshine-filled Sunday trying his hand at avoiding cones. Admittedly Greg was having a blast pushing his show car, Scarlett, to the edge. The months that followed would have Greg modifying his car to behave more appropriately around cones and before long he was a regular, racing at Goodguys events, SCCA races, NMCA competitions and more. From Spring of 2012 to present, Greg has been adding to his list of performance driving and racing accomplishments. He continues to win his way into Pro Class status at Goodguys and is competing monthly. Whether out at Willow Springs or Pomona Fairgrounds, Autoclub Speedway or Circuit of the Americas, it’s safe to say that Greg is hooked when it comes to going fast and racing. 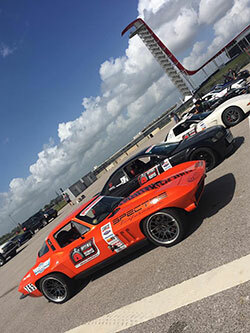 Last weekend we caught up with him at Optima Search for the Ultimate Street Car (OSUSC) in Austin, Texas, racing at the world class F1 venue, Circuit of the Americas (COTA). Thurmond made the haul from So Cal to Texas in his RV traveling almost 1500 miles to compete at this iconic track. This was one venue that he said is “bucket list” worthy and there was no way he would miss it. Having been a huge F1 fan most of his life, he felt he knew the road course before the green flag even dropped. He told us every turn felt surreal as he had watched the greats like Sebastian Vettel and David Coulthard take the same turns he was taking. To have set foot in the garages where his favorite drivers and their race teams had swapped motors, made improvements, prepped for races, was, “mind blowing”. Greg Thurmond pushing his Vette to the limit on the same road course where Sebastian Vettel and other F1 drivers compete in the US. Greg began racing with USCA last November at OUSCI. Approached at the Spectre Performance booth at SEMA, Optima Batteries invited Greg to participate at the annual, invite only event that took place at Las Vegas Motor Speedway, where he would compete among some of the nation’s finest amateur racers. Safe to say he loved it as evidenced by his return to OSUSC this year. As winner of the Participants Choice award at COTA, and receiving 3rd Place for Design & Engineering in the GTL Class, Greg is incredibly proud of what he has been able to accomplish with the build of SCAR. He told us the car was a desert find and with the support of more than 17 different sponsors, whose logos are painted in the stinger stripe on the hood, he would not have been able to be so creative with the build that ultimately is panning out to be an incredible pro-touring ride and crowd favorite. Greg sits in 22nd position in points for OSUSC after his third event. A mid-season class change has indeed affected his points placement. But he said he’s not worried. He has one more event to make up some much needed points to secure the invite to OUSCI and he is feeling confident. “I feel like I’ve finally got the car dialed in the way I like. 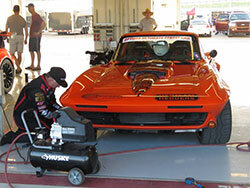 The Wilwood brakes are working great and the car is handling like a beast,” he said. The car was barely done a day or two before its debut at SEMA and that didn’t afford him much time for shake down. It’s great to hear that our Spectre Performance driver is feeling confident and decidedly becoming one to watch. He’ll compete again at Autoclub Speedway in Fontana, California, in October, giving him the home court advantage to narrow the gap in the point race. This very well may be the race that gets him back to Vegas for the Optima Ultimate Street Car Invitational - the Super Bowl of Optima Search for the Ultimate Street Car. For more information on the OSUSC series, log onto www.driveusca.com. And to improve your cars performance, check out Spectre Performance's wide array of products. The same performance products our Spectre Performance Driver’s use to improve the performance on their cars. Bright orange like the Texas sun, Greg’s 1965 Candy Tangerine Corvette affectionately named SCAR has what it takes to turn heads. Greg adding air pressure to his Falken Azenis RT615K tires in preparation for the road course. 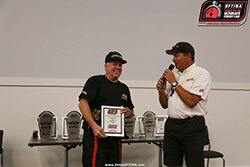 Greg Thurmond receiving the “Participant’s Choice” award from USCA Race Director, Jimi Day.